Letter - 8 1/2" x 11" Sheet Size - 3/4" Expansion - 1/3 Tab Cut - Assorted Position Tab Location - 11 pt. 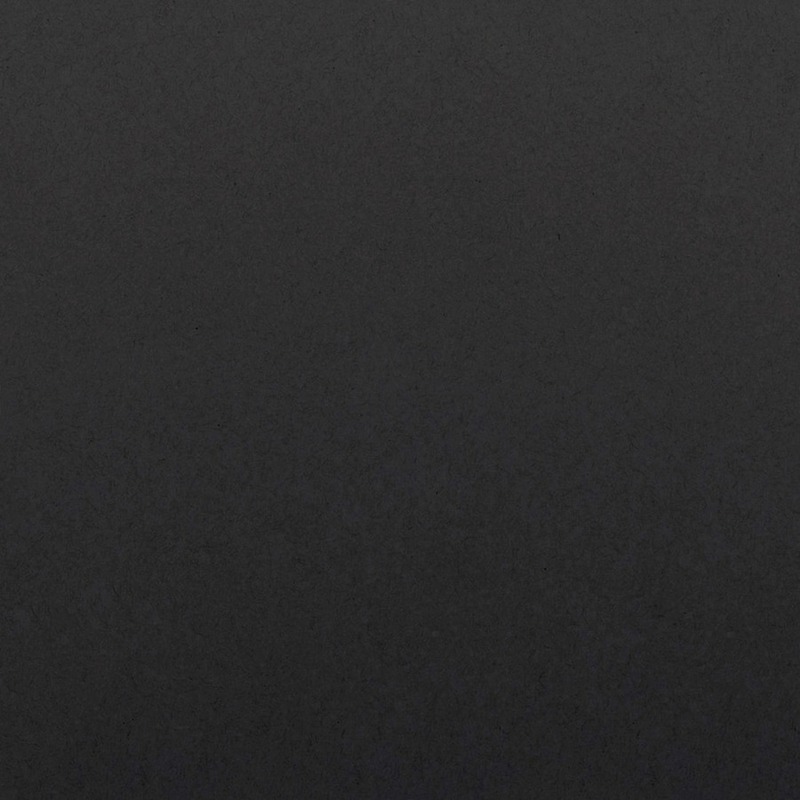 Folder Thickness - Black - Recycled - 100 / Box"
Folder Thickness : 11 pt. Special-sized folder with single-ply tab is designed to fit neatly inside hanging folders. These interior folders keep documents organized when removed from the file drawer. The 1/2" high tab is hidden when returned to the file so no interference with the vinyl tabs of the hanging folder. Assorted tab positions allow more than one interior folder to be used within a single hanging folder. Folder offers 11 point stock, undercut front panel, a 3/4" scored expansion and rounded top corners in front and back. 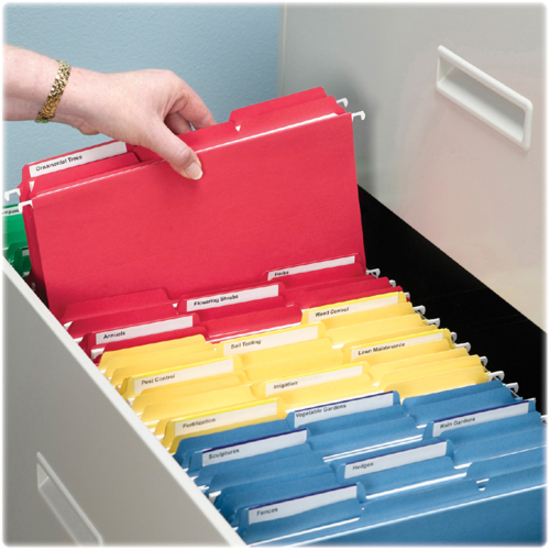 Keep documents organized when removed from the file drawer. These special-size folders fit neatly inside hanging folders so the tabs are hidden when returned to the file. The 1/2" high tab will not interfere with the vinyl tabs of the hanging folder. Assorted tab positions allow more than one interior folder to be used within a single hanging folder. Folder offers 11 point stock, undercut front panel, a 3/4" scored expansion and rounded top corners in front and back. Letter - 8 1/2" x 11" Sheet Size - 3/4" Expansion - 1/3 Tab Cut - Assorted Position Tab Location - 11 pt. Folder Thickness - Manila - Recycled - 100 / Box"
Letter - 8 1/2" x 11" Sheet Size - 3/4" Expansion - 1/3 Tab Cut - Assorted Position Tab Location - 11 pt. Folder Thickness - Orange - Recycled - 100 / Box"
Letter - 8 1/2" x 11" Sheet Size - 3/4" Expansion - 1/3 Tab Cut - Assorted Position Tab Location - 11 pt. Folder Thickness - Yellow - Recycled - 100 / Box"
Letter - 8 1/2" x 11" Sheet Size - 3/4" Expansion - 1/3 Tab Cut - Assorted Position Tab Location - 11 pt. Folder Thickness - Purple - Recycled - 100 / Box"
Letter - 8 1/2" x 11" Sheet Size - 3/4" Expansion - 11 pt. Folder Thickness - Manila - Recycled - 100 / Box"
Letter - 8 1/2" x 11" Sheet Size - 3/4" Expansion - 1/2 Tab Cut - Assorted Position Tab Location - 11 pt. Folder Thickness - Manila - Recycled - 100 / Box"
Letter - 8 1/2" x 11" Sheet Size - 3/4" Expansion - 1/3 Tab Cut - Left Tab Location - 11 pt. Folder Thickness - Manila - Recycled - 100 / Box"
Letter - 8 1/2" x 11" Sheet Size - 3/4" Expansion - 1/3 Tab Cut - Right Tab Location - 11 pt. Folder Thickness - Manila - Recycled - 100 / Box"
Letter - 8 1/2" x 11" Sheet Size - 3/4" Expansion - 1/3 Tab Cut - Assorted Position Tab Location - 11 pt. 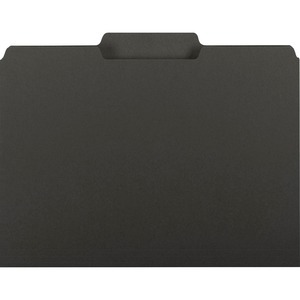 Folder Thickness - Gray - Recycled - 100 / Box"